It's getting to that time of year when the various summer fetes, fairs and festivals are all popping up vying for our attention, raising money for a multitude of worthy causes. 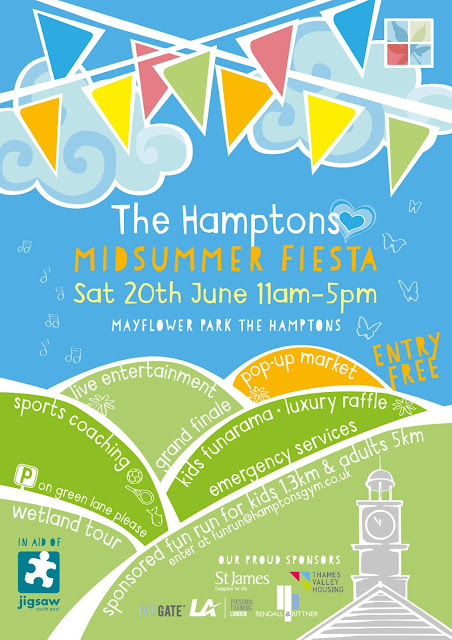 This year however is offering something new and possibly a bit special... 'Tis the inaugural Hamptons Midsummer Fiesta. The poster here on the left is fairly self explanitory; the important points being it is taking place next Saturday 20th June (one day prior to the summer solstice) and there will be lots of entertaining things happening. Entrance and most of the activities are free however money is being raised for the Jigsaw4u (Jigsaw for you) charity which helps children and young people get through bereavements and helps them put the pieces back together. The organisers have pushed for a particularly local flavour for the day with many of the popup market stalls selling items sourced or made locally in one way or another. There will also be police bike marking and numerous sporting events to participate in.